Prien's second patrol was to elevate the man from the small town in Thuringia to the status of legend, a sailor feted upon by the whole of Germany and its leader. After the chief of the U-boat fleet, Karl Dönitz (himself now an Admiral), had suggested an attack on the British Northern Fleet at the base of Scapa Flow in the Orkney Islands, Prien jumped at the opportunity. In an audacious night-time raid on the "impenetrable" British base on the night of 13/14 October 1939, U-47 attacked and sunk the battleship Royal Oak before escaping back to base unscathed and accepting the adulation of his chief, Nazi leader Adolf Hitler and the German people. Left: The "Bull of Scapa Flow" and his triumphant crew arrives in Wilhelmshaven to a rousing reception following the successful mission at Scapa Flow. 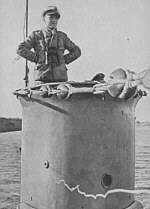 Right: Prien stands proudly on the conning tower. Captain Prien, commander of the submarine, came tripping into our afternoon press conference at the Propaganda Ministry this afternoon, followed by his crew - boys of eighteen, nineteen, twenty. Prien is thirty, clean-cut, cocky, a fanatical Nazi, and obviously capable. Introduced by Hitler's press chief, Dr. [Otto] Dietrich, who kept cursing the English and calling Churchill a liar, Prien told us little of how he did it. He said he had no trouble getting past the boom protecting the bay. I got the impression, though he said nothing to justify it, that he must have followed a British craft, perhaps a minesweeper, into the base. British negligence must have been something terrific. 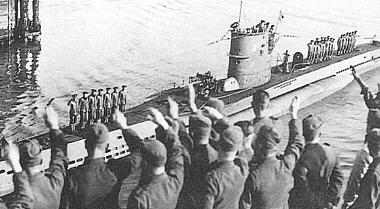 Left: Günther Prien and the crew of U-47 in Berlin prior to their meeting with Adolf Hitler in October 1939 following the sinking of the HMS Royal Oak at Scapa Flow. 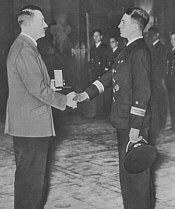 Right: Prien was soon afterwards presented with the Knight's Cross. On the evening of October 18, 1939, I accompanied my parents to the Wintergarten. 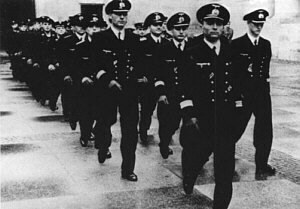 During the show, a rumour spread among the audience that Kapitänleutnant Prien and his crew would appear. The main door opened and the band began to play. The audience rose from their seats as Prien entered, accompanied by his wife as well as his crew. They were led through the cheering audience to their seats in the front rows. The wireless programme 'Wunschkonzert' was switched to the microphones of the show. During the interval, Prien was besieged by people asking for autographs. My mother succeeded in getting one for me and I proudly showed this to my classmates at school. The enthusiasm for Prien in Germany can only be compared with Britain's love for Admiral Nelson. I always kept the postcard with his autograph in my small suitcase with my favourite toys to take with me into the shelter during the bombing raids on Berlin in the years which followed. So it is today I still possess the autograph in spite of being bombed out and evacuated from Berlin. The evening show at the Wintergarten Theatre in Berlin where Prien and his crew received a rapturous welcome from the audience. Prien talks to Reich propaganda minister Josef Goebbels, while in the centre to Goebbels' left sits his wife Ingeborg. 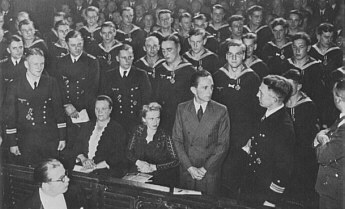 The other lady in the front row is Amelung von Varendorff's mother; her son stands in the front row to her right. Following the events at Scapa, Prien's reputation was boosted further by the Nazi propaganda machine, which sought to make capital out of his success. In 1940 the inevitable book chronicling the mission, Mein Weg nach Scapa Flow ("My path to Scapa Flow"), was released to the public. Ostensibly penned by Prien, Mein Weg nach Scapa Flow was in fact written by an author called Paul Weymar, who had been commissioned by the publisher Deutscher Verlag to ghost-write an autobiography for the skipper of U-47. The lavishly-illustrated work took the rudimentary facts and blended them with an almost silver-screen, Hollywoodesque hero-worship; Prien was not only seen sinking the Royal Oak under cover of darkness, but making good his escape in dramatic fashion while being pursued by a pack of enemy destroyers bent on his destruction. Drafted in a mere six weeks, Weymar's manuscript was littered with inaccuracies and written in a style clearly intended to aid the recruitment of young men into the Ubootwaffe; the primary purpose was to provide the German people with a heroic and morale-boosting story rather than a record of the historical course of events. Further alterations by both the German High Command and the Propaganda Ministry only served to add more errors to the text. It is particularly noteworthy that no mention was made in the book of the torpedo failures during the Scapa Flow raid, but as it was published in 1940 the exclusion of operational details which might help the enemy is perfectly understandable. At the time of its publication however, the fact that much of what could be found in Mein Weg had little to do with what actually happened at Scapa was not a major concern. Prien had made his way into Scapa Flow, the Royal Oak had been sunk, and he had got away safely. These were the most important facts, and it is perfectly understable given the time and nature of the story that many would have found it in their best interests to embellish it. The actual story of the mission was, in truth, rather pedestrian from an "propaganda entertainment" point of view; adding a pack of marauding destroyers to spice things up made the story all the more readable and exciting. In this respect the book clearly served its purpose: Prien quickly became a household name, and the German people - as well as the propaganda ministry - loved it. The "Bull of Scapa Flow" himself was to take a slightly different and somewhat more reserved view however, stating openly that he was "an officer, not a film star". His widow Ingeborg was said to have stated that Günther was "very angry" when he received the manuscript, and had "kept crossing things out". The changes her husband made were, she believed, never incorporated into the published book. The ghost-writer Weymar himself was unhappy with his association with the book, going so far as to state his refusal to be involved in anything to do with "Prien's book" ten years after the war in 1955.